Real estate agents can work from home and are often able to establish long term careers that are much more rewarding than a no-experience-required telecommute position. While working as a real estate agent is the ideal work for many people, there's also a bit more to consider before jumping into this new career path. A WAHM reader asked about the ins and outs of real estate—and whether it would be a good option for her. Is working from home as a realtor right for you? Here are four things you should consider first. Real estate shouldn't be viewed as a job—instead, it should be viewed as a business. New real estate agents will have the guidance of a broker, but the up-front costs and unpredictable income make it akin to starting a new business. 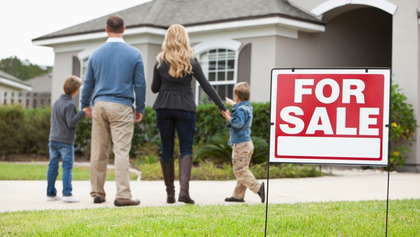 Selling a house, as well as assisting buyers, requires some advertising as well. The skills that come into play when managing a business will also come in handy as a real estate agent. Like any new business, real estate requires a significant amount of time put in—they often work for a few months before any payment comes in. While most open houses will take place on the weekend, managing properties, assisting buyers and managing a business will take up a significant portion of the week as well. A lot of the paperwork and behind the scenes efforts can take place in a home office, but real estate also means attending open houses and home inspections as well. Like other businesses, the more time you put into the work, the more likely you are to make a solid income. Real estate involves some training and start-up costs to get started, and the exact cost and training requirements will vary some by state. The expense is less than many other career options or obtaining a college degree, but it's there nonetheless. Be prepared to spend around $2,000 on courses, licensing and membership fees as well as business expenses like advertising. If you're looking for an hourly or salaried position, real estate isn't for you. Real estate agents earn a commission—which means income is unpredictable and sporadic. If you're really interested in the field, however, don't let that sway you. Many are able to make real estate a successful, long term career. There are typically a few months without pay before the first sale, but those who are able to make a long term commitment often find themselves in a successful business. Just be aware that good money management will come into play. Like any career, not just anybody can be successful in real estate—but those with the right skill set and dedication can find fulfillment (and income) here. Real estate agents receive help from brokers to get started, can earn large commission, have flexible schedules and can do a lot of work from home. However, there are start-up costs involved, income is commission-based and not always steady, and a large time commitment is involved. As Realtor® Mary Fenton chimed in on the WAHM forums, real estate is a good long-term career option, but not as a short-term, part-time option. To participate in the conversation, head here.